Last while browsing I came across a WordPress plugin called wpSuggest. This links Google’s autocomplete function (the thing called “Google Suggest”, which ensures that you get suggestions while typing your question) with the title field in the WordPress editor. So if you write an article in the WordPress backend and type the title wpSuggest will make suggestions for the perfect title. 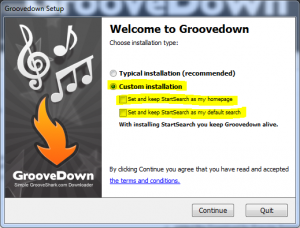 Just seen on Caschy’s blog and instantly tested just for you – GrooveDown – a DownloadHelper for Grooveshark. For those who are not familiar with Grooveshark, here is a brief introduction: Grooveshark is a mixture of Spotify and Youtube. It allows you to stream music without video, in good quality – provided by the users of Grooveshark and some music companies/labels. This article is dedicated once again to a small self-creation. So it’s about a little tool of mine, which I have created acouple of days ago, as in most cases, out of necessity. So I was recently looking for a opportunity to check a large list of links as easy as possible to identify the dead links out of it. At least if you have to check 20 or more links for their validity by hand, you realize that ther must be a better and faster solution. Therefore I have written a small program in C#, which helps you to check as many links/urls as you like for their validity. I have named the tool “404Checkr”, whereby 404 refers to the HTTP statuscode 404, which says that a page/file could not be found. Proudly I like to present to you the MySpace Loader. With the MySpace Loader you can, as the name implies, download music from MySpace. 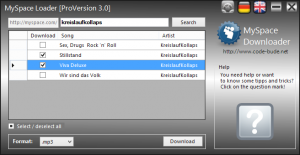 The program allows you to download multiple songs at once, is able to convert them into different formats and optionally equip them with ID3 tags. The whole thing is, as well as the Cloud Downloader, free. (Nevertheless I’m happy about every donation from you.) The download link can be found below the YouTube video in this article.